Malibu California is an affluent beach community in Northwestern Los Angeles County, California. Malibu is bounded by Topanga Canyon to the East, the Santa Monica Mountains consisting of Agoura Hills, Calabasas, and Woodland Hills to the North, the Pacific Ocean to the South, and Ventura County to the West. Malibu consists of 21 miles of Pacific Coastline that features a stunning array and variety of different homes. Most Malibu residents live within a couple hundred yards from the beach up narrow canyons and streets and have an eclectic array of Malibu Tile throughout their home. Malibu Tile can be seen as a variety of different styles based on the architectural style of the home; Modern and Contemporary, Mediterranean, Midwest Farmhouse, and Traditional Malibu Bungalow’s. Our tile shop offers array of styles, textures and patterns for Granite Tiles, Limestone Tiles, Marble Tiles, Sandstone Tiles, Slate Tiles and Travertine Tiles in Malibu, CA to renovate your walls or floors. For the contemporary and modern Tile Malibu beachfront home, the variety of materials will vary depending on the color scheme and location of the home. 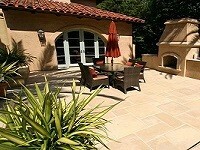 Many of our customers in these homes go with large format tiles in either concrete colors or very vibrant glossy white. For the contemporary and modern Malibu Tile beachfront home, the variety of materials will vary depending on the color scheme and location of the home. 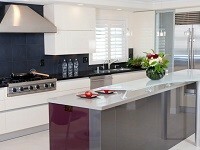 Many of our customers in these homes go with large format tiles in either concrete colors or very vibrant glossy white. We carry a new Concrete Tile company that can create large format Polished Concrete Tiles that range in size from 12”x12” all the way up to a 24”x48”.The benefit of a concrete tile look in Malibu homes is that it is a very clean surface that creates a reflection from the floor. The benefit of this reflection is that it minimizes the lines of the floor and shows off the walls throughout the home. We also carry a large selection of porcelain tiles that mimic the poured concrete look and are extremely durable and sustainable for these types of homes. The durability of a porcelain tile is unmatched for its maintenance is relatively low and there are an abundant selection of colors and textures to choose from.